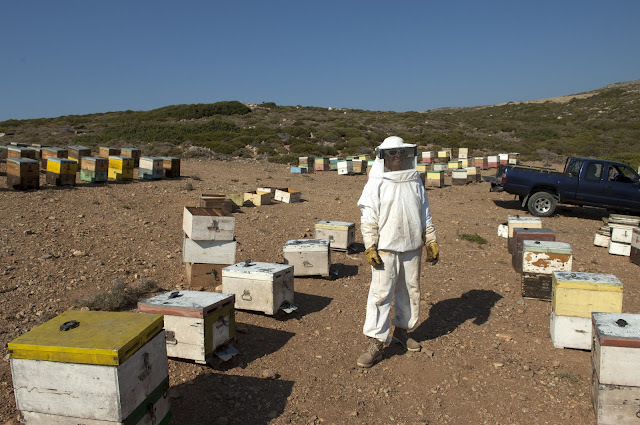 It's honey season here on the island, bee keepers are keeping watch over their flocks like shepherds watching their sheep. They are checking to see if the sweet golden nectar is ready for harvest. 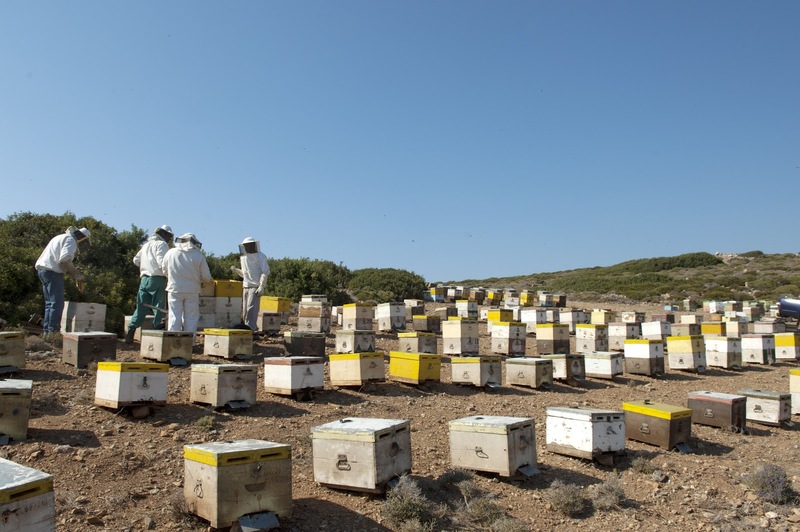 Some of our friends, amongst a lot of other things, farm bees or rather farm honey using bees. With over 400 hives to keep a watchful eye over our friends are quite busy at this time of year. This is when they start to harvest the honey from the hives, quite a lengthy process when you have many hives to deal with. 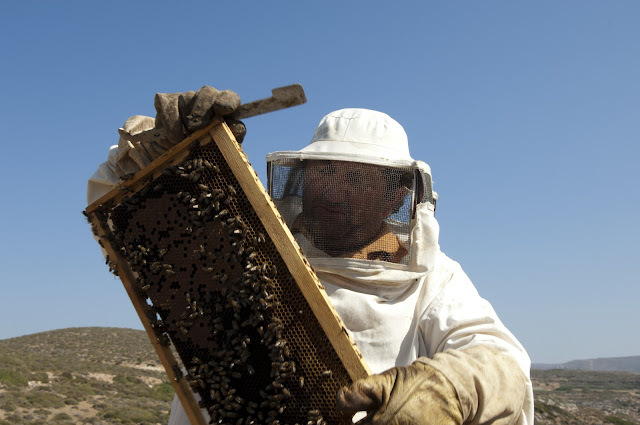 I have been asking for a while if I could join the harvesting team on one of their missions to bring in the honey. Yesterday I was lucky, I was invited along to join the team and take some photographs. I was quite excited and borrowed a bee suit from a friend who, at six foot two is somewhat taller than me and consequently I looked rather ridiculous but it was better than the alternative - being stung by a bunch of angry bees. The suit reminded me of what I can only imagine it feels like to be an astronaut. There are so many layers to it that eventually you find yourself quite restricted, the thick cotton designed to prevent the sting from reaching you acts like a slow cooker and gently heats you up to a point of boiling, with the only vents being troughs around your face allowing you to attempt to see what your doing. It's like walking around in your very own personal sauna. Even so I gratefully took the suit and met up with the team. We drove out to the eastern edge of the island to an area called Topluo where some of the hives were being kept. Once we got there everyone got dressed up in their space suits and we started the process, or rather they started the process - I tackled taking the photos. This is not the easiest thing to do when you have a mesh screen stopping you from seeing out of the view finder on the camera and the thickest leather gloves you can imagine turning your hands into shovels therefore making pressing the trigger on the camera almost impossible. After a dozen or so photographs I had sort of worked it out … I will admit to cheating as to make life a touch easier I flipped the focusing on the camera into auto. I had wanted to change lenses while we were there but that proved extremely difficult and I almost ended up with a bee in my camera! The bees are kept as far away from commercial farmland as possible, this is for a couple of reasons. 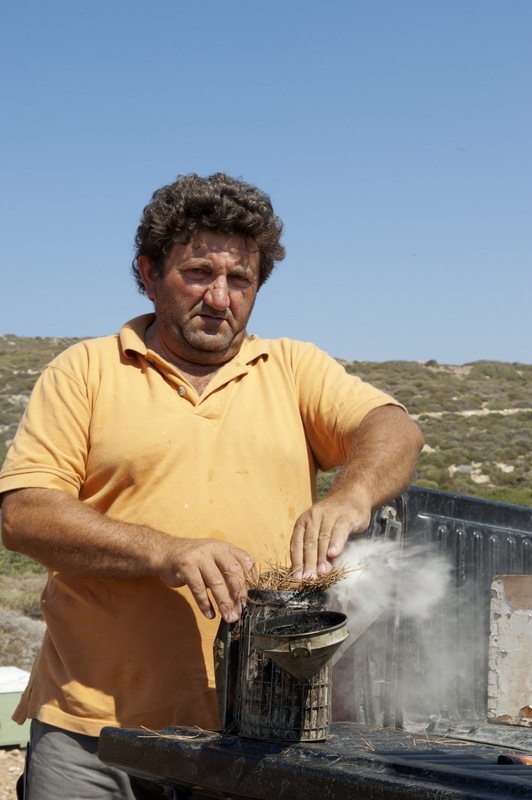 The farmers want to keep the bees away from chemical pesticides and fertilizers not only because it is bad for the bees to get sprayed but because at the end of the season the honey can be tested. 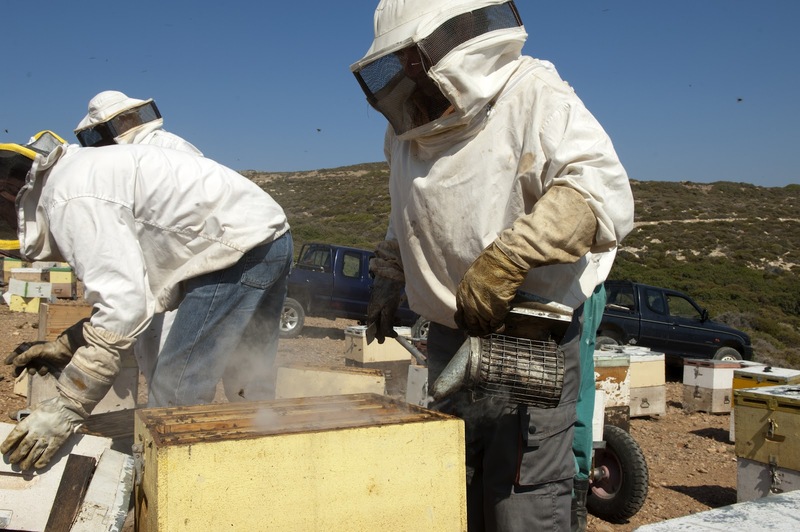 Provided that no trace elements of these chemical fertilizers or pesticides are found in the tests the famers can be given the right to call the honey "bio", which in this day and age is very helpful for marketing the honey. 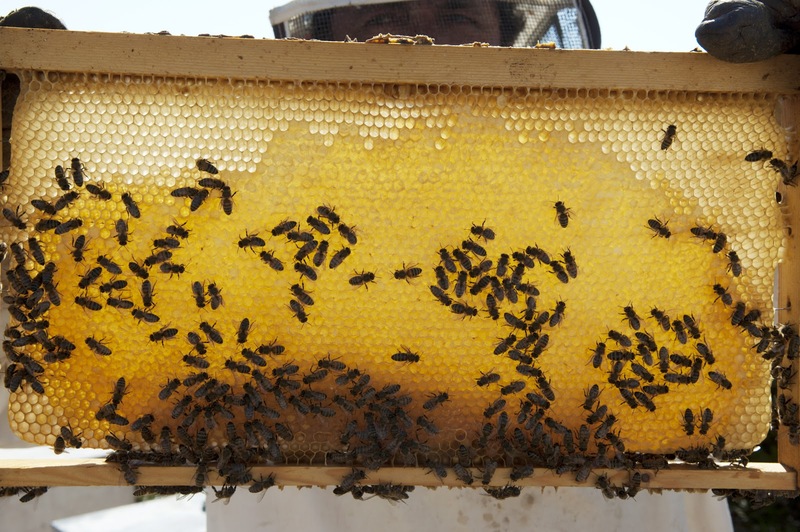 Each hive has a number of honeycombs inside. 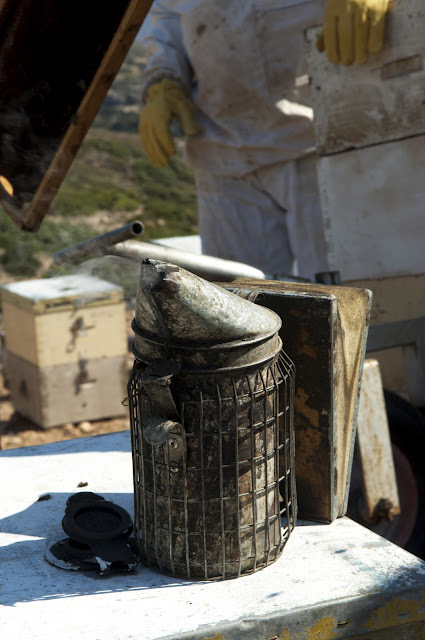 In order to help the bees and so that they are more productive the hives are recycled at the end of the season. Some are used for 12 years before they deteriorate so much that they are no longer productive. When this happens they are taken to the processing house and turned into candles for the church. Bees need to produce 45kgs of honey a year in order to keep the colony alive, anything over this the farmers take for themselves. 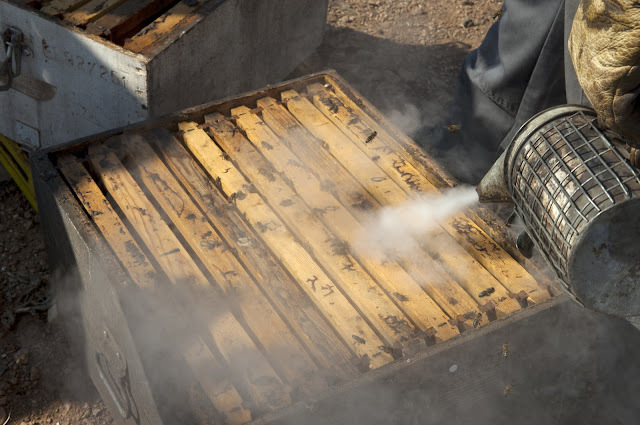 The trick is to keep taking small amounts out so that the bees keep producing but not to take so much out that the bees can no longer support themselves. On a good year each hive will produce 25kgs of honey over and above the 45kgs that the colony needs to survive. In a bad year they may not produce any excess at all. There are a number of factors which affect the bees ability to produce honey. The major player is, of course, the weather. Bees cannot fly in the rain, they don’t do well in very windy conditions, they don’t like the cold and they are not fans of very hot days… in other words they are quite fussy! The other key factor is food. Bees need pollen to make honey so if there are no flowers then there is no honey. These factors are why the hives are moved all over the island. 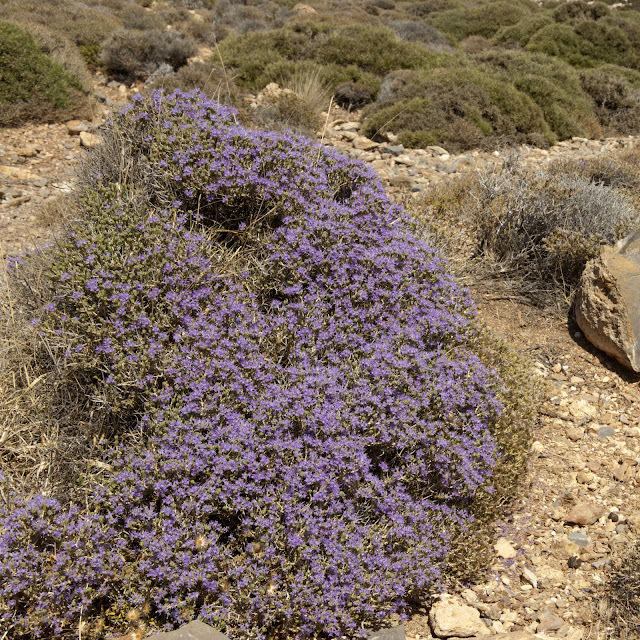 The hives are put in areas where they are protected from the elements and where the highest number of natural flowers are blossoming. When it comes to making honey you can trick the bees by feeding them sugar. The bees take the sugar and turn it into honey, except technically the honey which they produce in this way is not actually honey at all as it has an extremely low to no pollen count. If the bees make honey with sugar then the final product which you end up with is crystalized and very thick and a creamy light brown in colour. Natural honey is dark brown in colour and here in Crete it is thin enough to pour but thick enough for it to take a while to pour out of a jar. The honey which these bees produce is natural, they are not sugar fed so therefore depend on the flowers for their food. There is only one exception and that is in the winter months when the island resembles a rock in the middle of the south Atlantic, battered by raging waves and vast storms, the time of year where all in one go we receive our 60 days of rain and you honestly think the island might sink into the Mediterranean. It’s only during this time that the bees are fed a concoction of sugar, water and lemon juice to keep the colony alive while it waits for spring. 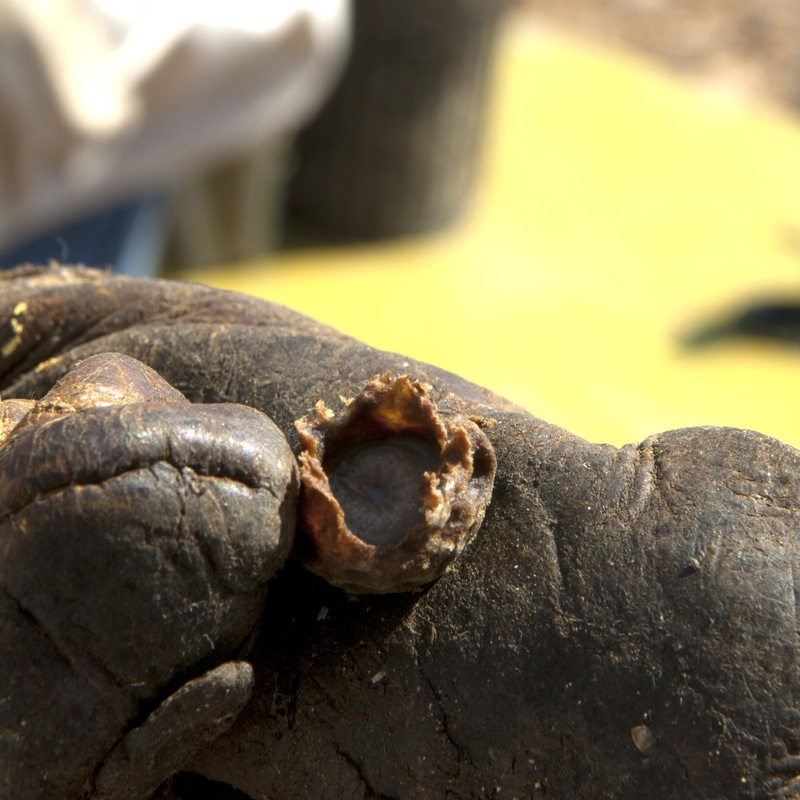 The actual process of hunting honey is relatively simple. Cedar needles are put into a pot and lit for their smoke, which is pumped onto into the bee hives to calm them down before the hives are opened. 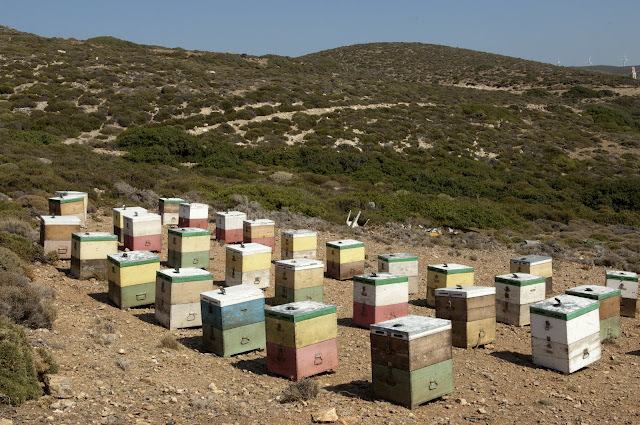 Despite the fact that the hives are all in one place – limiting the search zone for the honey – it’s still not that easy. Each hive contains a number of honeycombs or long flat paddles which the colony has used to make part of the hive. 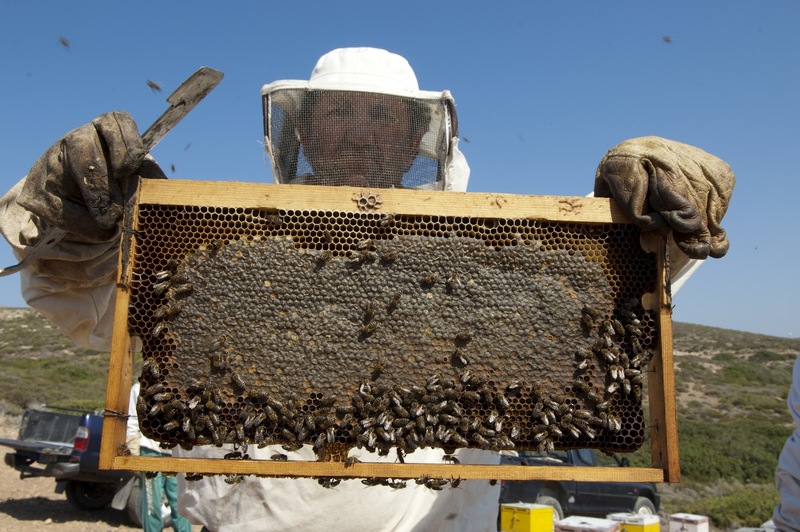 Once opened the beekeepers / men in space suits use a small metal bar to lift up each paddle. 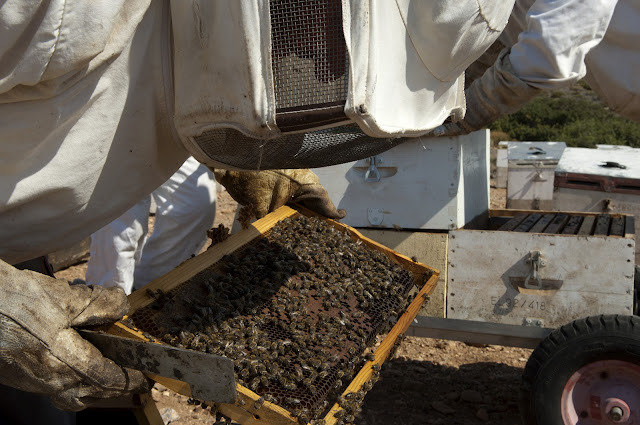 They knock the top to shake off all the bees and then pull it out to inspect it for honey. 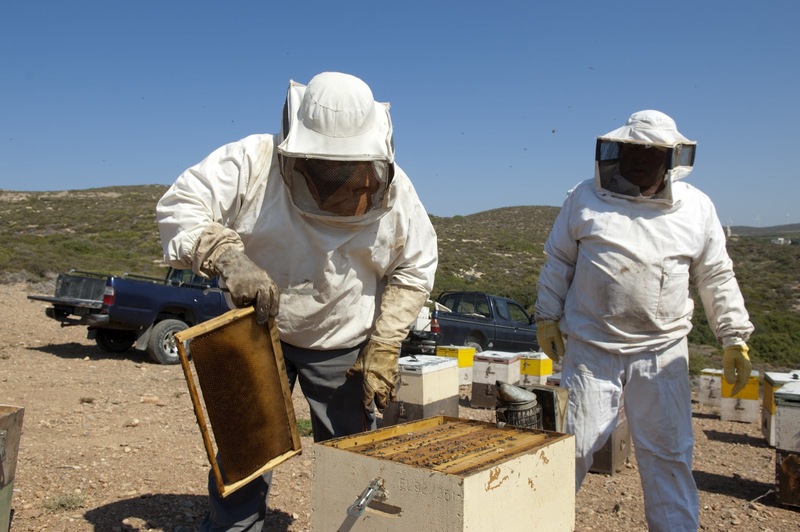 If it is deemed that there is enough honey in the honeycomb they take it out and hand it over to another member of them team who puts it into a storage unit to be taken to the processing house. 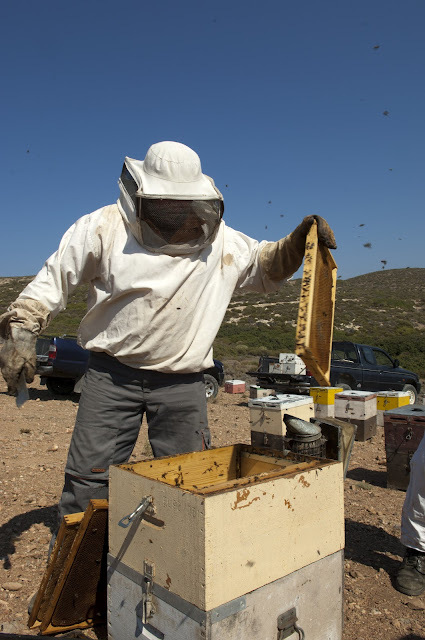 This team member hands the first chap an empty honeycomb to put back into the main hive for the colony to fill with honey. Sounds simple, but with up to ten flat paddle honey combs in each box and two boxes stacked on top of one another to create the hive it is somewhat time consuming. The more you recycle the honeycombs the darker they get, making working out if there is any honey in the combs quite tricky. The honeycombs which, are full of honey are taken home with the farmers and then onto the processing house where the honey will be extracted from the honeycombs. Processing to follow ..